This is a guest post by Faris Sleem @TradeWithTechs. 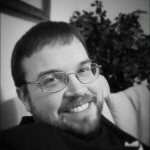 This article originally appeared on his website at www.tradewithtechs.com and is republished here with permission. Trend trading is one of the most common trading methods due to its success. Personally, I trade continuation chart setups for stocks in a strong bullish trend. Ideally, you are trading a stock that has a long-term and short-term bullish trend. The benefits are unbelievable if you go with the trend. The biggest reason is obviously that there is a high probability that the stock will continue to trend higher. To me, trading was never a matter of winning but really just a matter of not losing. If you are shorting a stock that is in a bull trend or buying a stock that is in a bear trend, you are likely to lose money. IT’S AS SIMPLE AS THAT! 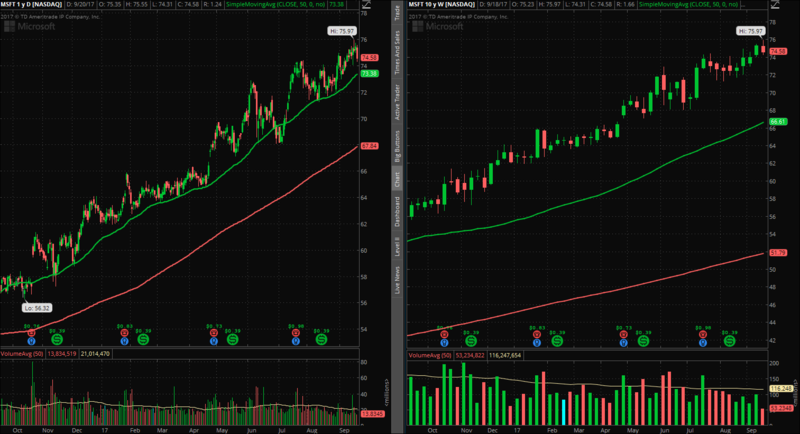 Let’s take a look at the Microsoft (MSFT) 1 year 1 day and 1 year 1 week charts side by side as an example. As you can see, MSFT has been in a steady upward trend for the past year. This is recognized by the higher swing highs and higher swing lows, which I will go over later. Notice that regardless of your entry point, if you were to short MSFT or buy put options, you would have gotten burnt. The largest pullback from a high was about 5%, which isn’t worth going against the trend. The stock closed higher on a weekly basis 36 out of the 52 weeks. That means that on a weekly basis, the stock was going up 70% of the time. So with perfect execution, you can only make money against the trend 30% of the time. Therefore, it’s obvious that by going with the trend you can clearly make money on the way up but also AVOID losing money! Another big benefit is the ability to choose how fast you want to make money. By selecting stocks with stronger trends, you are able to put yourself in higher risk/reward scenarios. 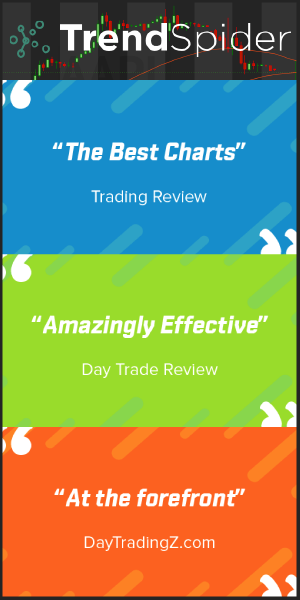 This allows you to pick and choose what kind of stocks you want to trade based on your comfort zone. Since we are currently in a bull market, there are tons of stocks to pick from. If you are trying to trade a reversal, you are either trading with high risk/reward or a low probability of the trade working out. Either way, trend trading overshadows this strategy. This is probably the hardest aspect of trend trading. Trending stocks are hard to spot in a bull market as you may not be able to tell if the stock is showing relative strength to the market. The easiest ways to recognize a trend are by using moving averages and/or finding swing highs and swing lows. What are swing highs and swing lows? 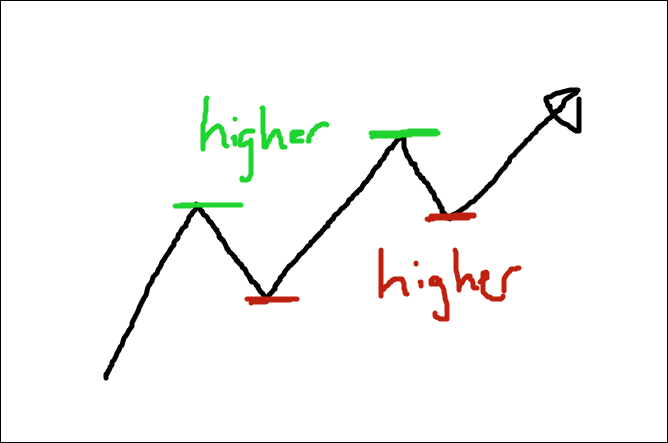 Swing highs are temporary highs that cause a short-term pullback. Swing lows are exactly the opposite. 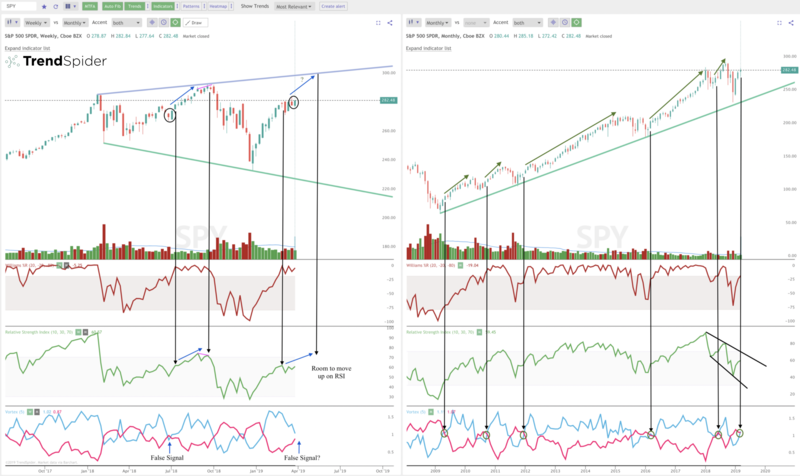 For example, in the image below you can see the swing highs (green) and the swing lows (red) of a bullish trend. 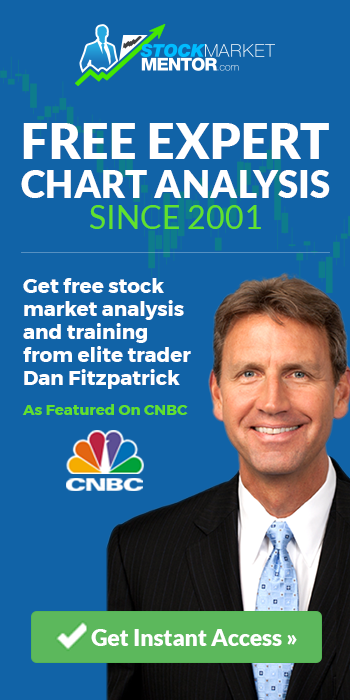 Draw a line chart on whatever type of chart that you’re currently using (Candlestick or Bar). Mark the “V”‘s in a different color. Mark the inverse “V”‘s in a different color. It’s important to note that a bullish trend consists of two consecutive higher swing highs and two consecutive higher swing lows. That is 100% confirmation of the trend. In the chart below, you can see that the stock only had two lower swing highs (circled in green) but did not confirm a reversal. The chart put in one lower swing low (circled in red) but still did not confirm a reversal. Another common method of recognizing a trend is by using moving averages. To keep things simple, I will just use Simple Moving Averages (SMA’s) in this example. This is a calculation table for a 5 SMA. 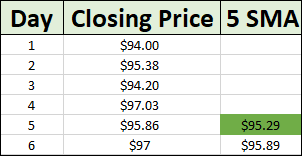 The highlighted green cell is the average of the prices from day 1 through day 5. As you can see, the 5 SMA increases by 70 cents after the price jumps by $1.14 from day 6 to day 7. This is because it now takes the average closing prices of day 2 through day 6. This allows traders to get a better read on the price action and avoid getting scared out of a stock. The price versus SMA interpretation is quite simple. Where is the price in relation to the key SMA’s? 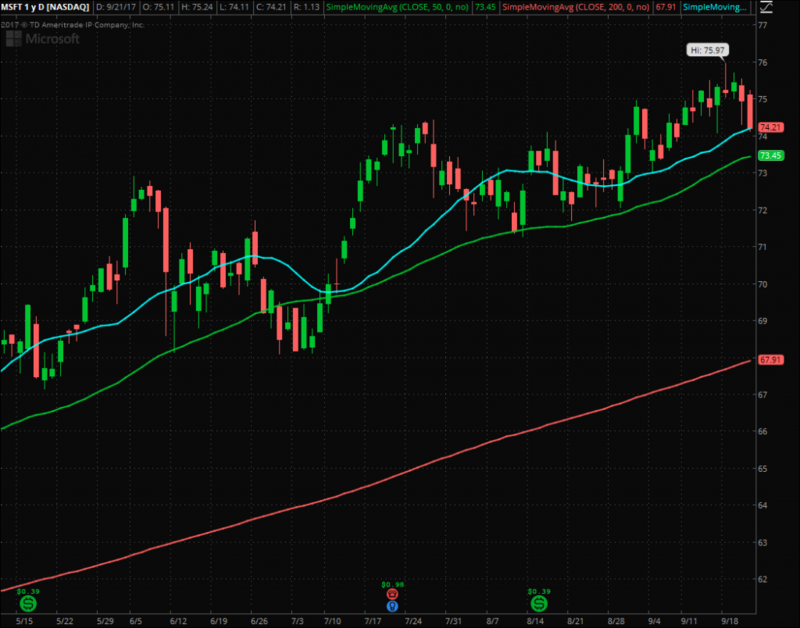 In the MSFT example, you could see that the stock is clearly above the 50 and 200 SMA’s. This shows that the stock is bullish. It’s not ideal if the price is below key SMA’s as they could act as resistance. The SMA versus SMA is the most common interpretation. Traders use SMA crossovers for signals, but I’m just talking about comparing the SMA values. SIMPLE RULE: If the lower length moving average has a greater price than the higher length moving average, then the stock is bullish short-term (and potentially long-term too). 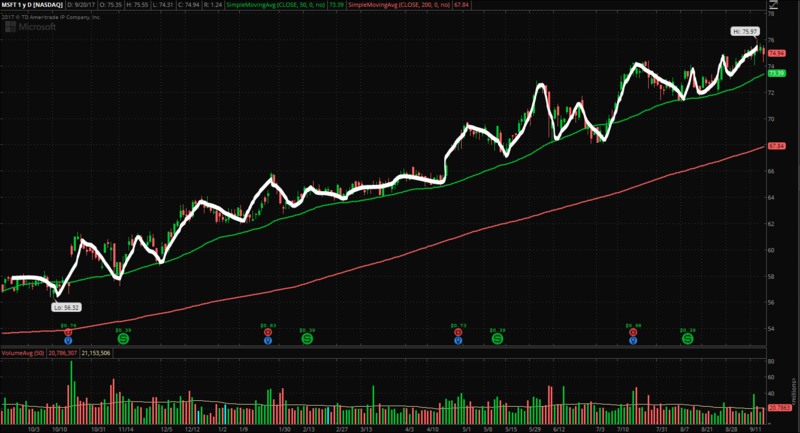 Let’s add in the 20 SMA (light blue) for MSFT to get a short-term trend indication when comparing moving averages. Since the 20 SMA > 50 SMA, we can assume that the stock is in a bullish short-term trend. Since the 50 SMA > 200 SMA, we can assume that the stock is in a long-term bullish trend. 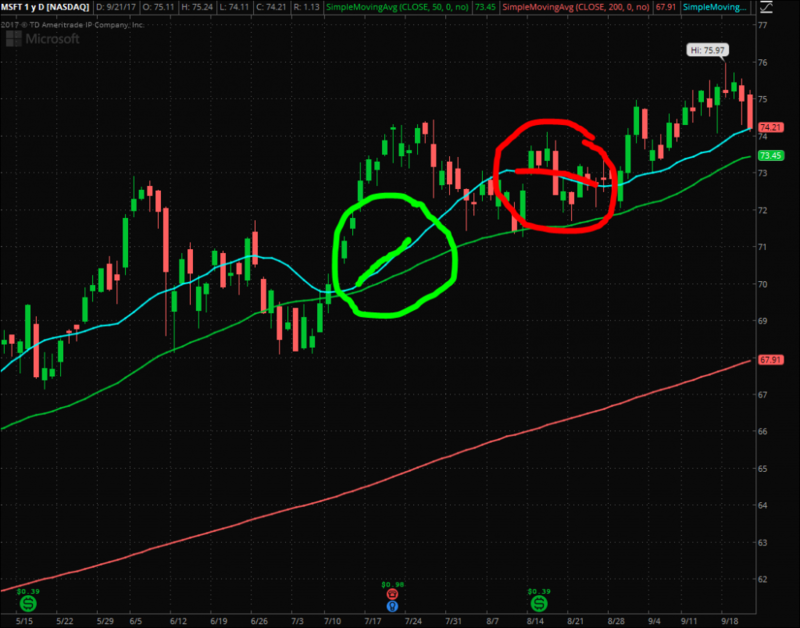 Within the green circle, you can see that MSFT has an aggressive short-term trend because of the upward sloping 20 SMA. 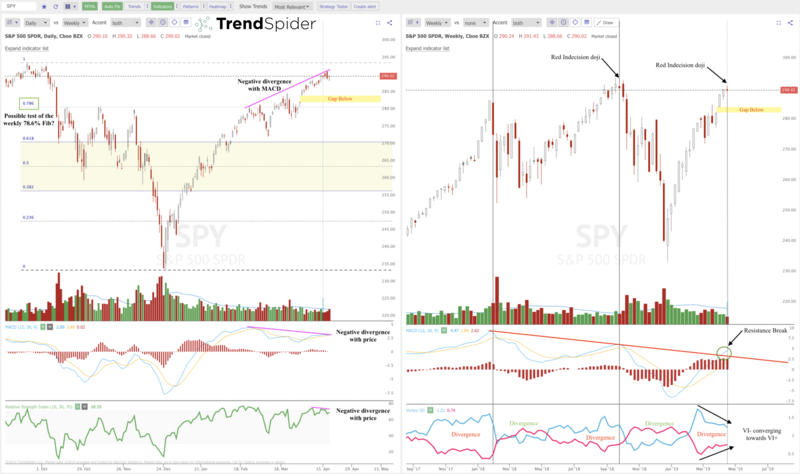 The flat slope of the 20 SMA within the red circle shows that there is a weak short-term trend. A shift in the slope could be telling you that it’s time to get in/out of the stock. Buy on weakness, sell into strength. Go with the long-term trend. Make sure the stock is trading above key moving averages that could be support/resistance. If you follow those basic rules, you should be a successful trend trader in no time! There are various chart indicators that can also tell you the strength of a trend and when it starts shifting, but we’ll keep it simple for now. And for those of you that think that trend trading isn’t “fun”, I have news for you – INVESTING ISN’T SUPPOSED TO BE FUN! The goal is to make money, not see how much “fun” you can have trying to nail the bottom and get an adrenaline rush. This trend trading style is my personal investment style and I urge you all to find what works for you. Happy trading! 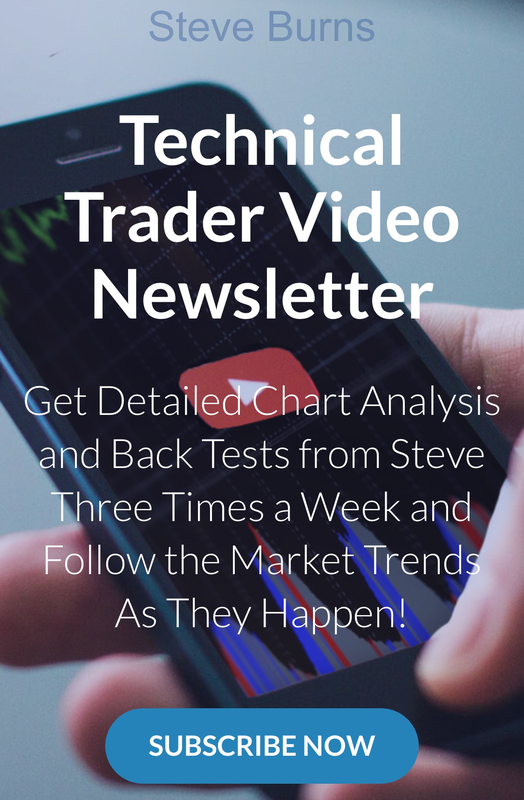 This guest post was by Faris Sleem you can follow him on twitter @TradeWithTechs. His website is www.tradewithtechs.com .